Welcome the IMPDb Suggestions page. Here we encourage everyone to share their ideas or thoughts. Remember, to get full use of the site you must create an account. To add to this page, select the 'edit' tab at the top of the page. If you are a registered user and would like to leave your signature, you can use ~~~~ at the end of your comments/suggestions. Add your suggestion plus any details you know about aircraft in the production. La jetée : at least a Caravelle and a DC-8 on the tarmac. Nate Decker (of Million Monkey Theater) thinks it is a Cessna T-50. I can send his screen capture if you'd like. Munich : Night scene with Bell 204/205 / UH-1 and Boeing 727. To Live and Die in L.A. / Police fédérale Los Angeles : a chase inside the terminal with (at least) a B-727 of Werstern in the background. So, what do you wait to built the page ? The IMPDb:New Users and IMPDb:Example Page are done to help you in your projects. LVCDC 26 april 2013. Year of Living Dangerously. At the begining and end of the movie, a "Royal Netherlands" Boeing 707-338C can be seen, (the aircraft is actually on lease from the Royal Australian Air Force, who's basic colour scheme it carries). A C-130 Hercules can also be seen in the backround. (Please note that some work could be incomplete). "The Rose" starring Bette Midler as a touring rock star also starred a corporate Vickers Viscount 700 used as her personal transport throughout the movie. Full page at : The Adventures of Rocky and Bullwinkle - LVCDC 19 avril 2013 (updated on August 2014). Entourage (HBO Series), at the end of the Episode8 of Season8, you can see a GIV and a Bombardier Challanger, also in Season4 Episode11 you can see a special B727. Thanks for the film request ECBBFan! Add "Boeing Boeing" (1964). It's been a while since I've seen the movie. I remember that there are BAC 1.11's, various large propliners, and, of course, the Boeing 707. The DVD is coming out shortly. Please add the TV Show Combat Hospital. In the beginning of Episode 1 is a C-17. Don't forget about the awesome flying in Never Cry Wolf an older Disney production. Things to Come (1936) has a lot of aviation in it. The story is divided into three periods: a contemporary war, an aftermath where civilization has fallen, and a renaissance portraying a rebuilt high-tech society. Most of the aircraft are fictional, but a practical biplane figures prominently in the middle segment, and contemporary aircraft are glimpsed in the first segment. Futuristic scout planes, flying wings, spacecraft, and VTOLs also appear. 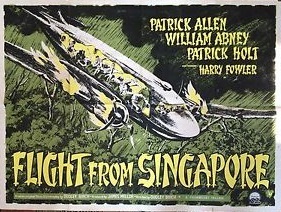 The film suggests that enlightened aviators can save the world. It's only one of the episodes featuring aerial vehicules. Look at Columbo. a first issue needs probably some additions. 26 October 2014. La Bamba and its ill-fated 3rd February 1959 which makes legends of Buddy Holly and Ritchie Valens. The Firm (1993), first of the name. Terminator 3: Rise of the Machines suggested by Bruce Cupchoy, completed by Bthebest. Catch-22 suggested by Ray Richey, completed by Sixcyl. Iron Eagle I, II, III, IV suggested by babaganoosh and BeerGremlin, completed by Bthebest. You Only Live Twice suggested by SoCalAviator, completed by Kooshmeister and others. Enemy at the Gates suggested by Smbelser, completed by Sixcyl. Space Cowboys suggested anonymously, completed by Bthebest and others. U-571 suggested by Madcamps, completed by LVCDC. Act of Valor suggested by drumaboy590, completed by Sixcyl. Hot Shots! suggested by Bonne1978, completed by LVCDC. The Sum of All Fears suggested by Bantha121, completed by LVCDC. Apollo 13 (1995) suggested by CaptSkibi, completed by LVCDC. Green Lantern suggested in 2011, completed by LVCDC. The Constant Gardener suggested by Vulcanmeister, completed by LVCDC. The Hindenburg suggested by Puterboy2, completed by LVCDC and Sixcyl. Hindenburg (2011 TV Movie) suggested by Puterboy2, completed by LVCDC. Lord of the Flies (1963) suggested by Puterboy2, completed by LVCDC. Flight of the Intruder suggested by moliva, completed by LVCDC. Flying Tigers (1942) suggested by moliva, completed by LVCDC. Midway suggested by moliva, completed by Check-Six. The Final Countdown suggested by moliva, completed by LVCDC. Raid on Entebbe suggested by moliva, completed by LVCDC. Conflict of Wings suggested by KSE ?, completed by LVCDC. Aerial Gunner suggested by moliva, completed by LVCDC. Viper suggested by Mieguy, completed by Mieguy. Empire of the Sun suggested by moliva, completed by LVCDC. Skyjacked suggested by Graham1973, completed by LVCDC. The Rose anonymous suggestion, a first trial by LVCDC. Decision Before Dawn suggested by moliva, completed by LVCDC. Appointment in London suggested by moliva, completed by LVCDC. Pancho Barnes suggested by AvidFlyer, completed by LVCDC. Julie suggested by moliva, completed by Corkeyandpals. Battle Hymn suggested by moliva, completed by LVCDC. The Black Stallion Returns suggested by Puterboy2, completed by himself. The Thousand Plane Raid & Otoko-tachi no Yamato suggested by moliva, completed by LVCDC. The Arrow suggested by moliva, completed by LVCDC. Columbo suggested by LVCDC, started by Corkeyandpals. Toward the Unknown suggested by moliva, completed by LVCDC. The Pilot suggested by Graham1973, soon completed by LVCDC. Fail Safe (1964) and Test Pilot both suggested by moliva, completed by LVCDC. For Whom The Bell Tolls suggested by moliva, screenshots by LVCDC. HeliCops - Einsatz über Berlin suggested by moliva, started by Mieguy. Boeing Boeing suggested anonymously, completed by LVCDC. Non-Stop suggested by WoodenDoor45, added by Corkeyandpals. Roberto Carlos em Ritmo de Aventura suggested by moliva, added by Corkeyandpals. God Is My Co-Pilot suggested by moliva, started by Corkeyandpals. Seven Were Saved suggested by moliva, completed by LVCDC. The Hunters suggested by moliva, completed by LVCDC. The Crowded Sky suggested by moliva, completed by LVCDC. Passenger 57 suggested by Graham1973, completed by Corkeyandpals. L'ultimo cacciatore suggested by Graham1973, completed by Corkeyandpals. Notorious (suggested by moliva) and Im Alter von Ellen, completed by LVCDC. Pan Am (TV Series) started by Corkeyandpals. The Great Gatsby (2013) suggested by LVCDC, completed by Mark0. Escape from Alcatraz suggested and completed by LVCDC. Heartburn (1986) suggested and completed by Athensoh. Jet Attack (1958) suggested and completed by LVCDC. Chung seung wan siu (Triumph In the Skies) (TV Series, 2003) and Chung seung wan siu II (Triumph In the Skies II) (TV Series, 2013) suggested by Love Krittaya, added by LVCDC. Victory at Entebbe (film) suggested by moliva; this is a draft done by LVCDC. SimCopter. Features Agusta AW109, Bell 206 JetRanger, Bell 212, Boeing AH-64 Apache, Boeing F-15 Eagle, Eurocopter AS365 Dauphin, Hughes 300, MD Helicopters MD 500, MD Helicopters MD 520, MD Helicopters MD Explorer, and unknown single-engine airplane. This page was last modified on 28 March 2019, at 13:11.